What's an appropriate core material for a loopstick antenna? This particular example is actually two antennas on one core. What type of material is an appropriate core for these antennas? What material parameters are relevant in the selection of an appropriate core, and how do they affect antenna performance? As it's name implies, a loopstick antenna is a magnetic loop antenna and is one of the best choices for an electrically short antenna; necessary because broadcast AM wavelengths are hundreds of meters long. Rather than a regular loop, a loopstick utilizes a large amount of (usually Litz) wire wrapped around a ferrite rod. This forms an inductor which is tuned to resonance by a variable capacitor as the radio is tuned to a frequency. The material for the core of these antennas is ferrite -- a powdered iron based magnetic material with a variety of other metals added. The exact composition of the ferrite material (called it's "mix") governs it's characteristics. The goal of the ferrite is to produce a very high Q inductor with a high electrical resistance. The efficiency of the inductor is governed by the permeability of the ferrite core and the core's permeability changes with frequency. 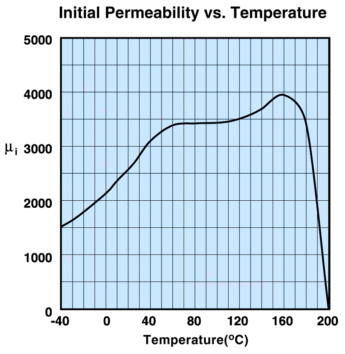 In the chart, μ' is the permeability of the ferrite and μ" is the ferrite induced losses. 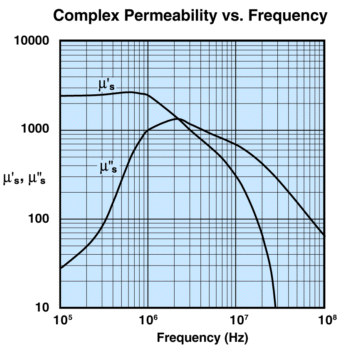 While the permeability continues to rise until about 11 MHz, the loses begin to rise dramatically starting at about 4.5MHz. This is why Fair-Rite Corp only recommends this mix through about 5MHz. This is a chart of their "mix 61", which uses Nickel and Zinc in the iron to achieve it's characteristics and is recommended as the proper one for AM broadcast frequency antenna material. It's worth noting in this chart that the losses are much higher than the MF band material, but so is the permeability. This is probably a good time to underline an important characteristic of ferrite: while it concentrates the magnetic fields, it has a very high electrical resistance. This isn't very important for receiving. But the use of ferrite in a transmitting antenna, or as is more common among hams, as a transformer in baluns or ununs, it can be important. And this is how baluns and ununs fail. Power through the transformer warms the material due to the ferrite related loses. All is OK until the curie temperature it reached and then the permeability falls off a cliff and the resistance increases causing more heating in a runaway thermal loop until your coax melts and shorts the inner conductor to the shield. Not the answer you're looking for? 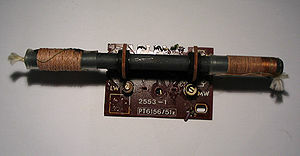 Browse other questions tagged antenna antenna-construction ferrite magnetic-loop or ask your own question. Where does one find high-voltage variable capacitors and inductors for RF? Do a toroid's specs matter much in an antenna matching transformer?